successful relationship is composed of two individuals – each with a clearly defined sense of her or his own identity. Without our own understanding of self, of who we are, and what makes us unique, it is difficult to engage in the process of an ongoing relationship in a way that functions smoothly and enhances each of the partners. We need a sense of self in order to clearly communicate our needs and desires to our partner. When we have a strong conception of our own identity, we can appreciate and love those qualities in our partner that make him or her a unique person. When two people come together, each with a clear definition of her or his own individuality, the potential for intimacy and commitment can be astounding. The similarities between two people may bring them together, but their differences contribute to the growth, excitement, and mystery of their relationship. identities, the potential can be astounding. One feature of a healthy sense of self is the way we understand and work with boundaries. Personal boundaries are the limits we set in relationships that allow us to protect our selves. Boundaries come from having a good sense of our own self-worth. They make it possible for us to separate our own thoughts and feelings from those of others and to take responsibility for what we think, feel, and do. Boundaries allow us to rejoice in our own uniqueness. Intact boundaries are flexible – they allow us to get close to others when it is appropriate and to maintain our distance when we might be harmed by getting too close. Good boundaries protect us from abuse and pave the way to achieving true intimacy. They help us take care of ourselves. 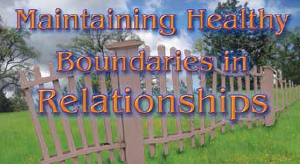 Unhealthy boundaries often emerge from dysfunctional family backgrounds. The needs of parents or other adults in a family are sometimes so overwhelming that the task of raising children is demoted to a secondary role, and dysfunction is the likely result. Consider the role of the father who screams at his children or becomes physically abusive with them as a way of dealing in a self-centered way with his own anger. His needs come first, and the needs of the children for safety, security, respect, and comfort come second. What the children are likely to learn in this situation is that boundaries don’t matter. As they grow up, they lack the support they need to form a healthy sense of their own identities. In fact, they may learn that if they want to get their way with others, they need to intrude on the boundaries of other people – just as their father did. They would likely grow up with fluid boundaries, which may lead to dysfunctional relationships later on in life. They would have a hazy sense of their own personal boundaries. Conversely, they may learn that rigid and inflexible boundaries might be the way to handle their relationships with other people. They wall themselves off in their relationships as a way of protecting themselves, and, as a consequence, may find it difficult to form close interpersonal bonds with others in adulthood. When we lack a sense of our own identity and the boundaries that protect us, we tend to draw our identities from our partner. We can’t imagine who we would be without our relationship. We become willing to do anything it takes to make the relationship work, even if it means giving up our emotional security, friends, integrity, sense of self-respect, independence, or job. We may endure physical, emotional or sexual abuse just to save the relationship. The more rational alternative is to find out who we are and what makes us unique, and to rejoice in this discovery. Realize that your value and worth as a person are not necessarily dependent on having a significant other in your life, that you can function well as an independent person in your own right. When you move into accepting yourself, your relationships will actually have a chance to grow and flourish. This journey of self-discovery can be challenging – but highly rewarding. Working with a trained therapist can provide the structure and support we needed to take on this task. We may cling to the irrational belief that things are good enough in the relationship – that we feel a measure of security and that this is as good as it’s likely to get. In the process, however, we give up the chance to explore our sense of fulfillment in life. We give up our own life dreams in order to maintain the security of a relationship. There is a feeling that if one of the partners grows and finds personal life fulfillment, the relationship would be damaged. A healthy relationship is one in which our boundaries are strong enough, yet flexible enough, to allow us to flourish with our own uniqueness. There is a sense of respect on the part of both partners that allows each to live as full a life as possible and to explore their own personal potential. We don’t have to give up ourselves for a relationship. Healthy boundaries allow trust and security to develop in a relationship. One characteristic of growing up in a dysfunctional household is that we may learn to feel guilty if we fail to ensure the success and happiness of other members of the household. Thus, in adulthood, we may come to feel responsible for our partner’s failures. The guilt we feel when our partner fails may drive us to keep tearing down our personal boundaries so that we are always available to the other person. When we feel overly responsible for another person’s life experiences, we deprive them of one of the most important features of an independent, healthy and mature life – the ability to make their own life choices and accept the consequences of their decisions. People who grow up in a dysfunctional family may fail to learn the difference between love and sympathy. Children growing up in these conditions may learn to have sympathy for the emotional crippling in their parents’ lives and feel that the only time they get attention is when they show compassion for the parent. They feel that when they forgive, they are showing love. Actually, they are rescuing the parent and enabling abusive behavior to continue. They learn to give up their own protective boundaries in order to take care of the dysfunctioning parent. In adulthood, they carry these learned behaviors into their relationships. If they can rescue their partner, they feel that they are showing love. They get a warm, caring, sharing feeling from helping their partner – a feeling they call love. But this may actually encourage their partner to become needy and helpless. An imbalance can then occur in the relationship in which one partner becomes the rescuer and the other plays the role of the helpless victim. In this case, healthy boundaries which allow both partners to live complete lives are absent. Mature love requires the presence of healthy and flexible boundaries. Sympathy and compassion are worthy qualities, but they are not to be confused with love, especially when boundaries have become distorted. Healthy boundaries lead to respect for the other and equality in a relationship, an appreciation for the aliveness and strength of the other person, and a mutual flow of feelings between the two partners – all features of mature love. When one partner is in control and the other is needy and helpless, there is no room for the normal give-and-take of a healthy relationship. Children from dysfunctional households often feel that things will get better someday, that a normal life may lie in the future. Indeed, some days things are fairly normal, but then the bad times return again. It’s the normal days that encourage the fantasy that all problems in the family might someday be solved. When they grow up, these adults carry the same types of fantasy into their relationships. They may portray to others the myth that they have the perfect relationship – and they may believe, to themselves, that someday all of their relationship problems will somehow be solved. They ignore the abuse, manipulation, imbalance and control in the relationship. By ignoring the problems, they are unable to confront them – and the fantasy of a happier future never comes to pass. Unhealthy boundaries, where we collude with our partner in believing the myth that everything is fine, make it difficult to come to terms with the troubles of the relationship. Learning to have healthy boundaries is an exciting adventure, an exercise in personal liberation. It means coming to know ourselves and increasing our awareness of what we stand for. It also means self-acceptance and knowing that we are OK as we are and worthy of the good things in life. When two people with healthy boundaries enter into a relationship, they encourage wholeness, independence, and a zest for life in their partner. They know that trust is possible and that the normal expected difficulties found in all relationships can be worked on constructively. They can find true intimacy as whole, complete and equal people. The journey to a sense of healthy identity is not always easy – but it need not be all that difficult. It often means letting go of some of our old misconceptions about the nature of the world. It means treating ourselves with respect and appreciating ourselves for what we really are. When we can do this for ourselves, we can take the same approach toward our partner – and then the true happiness and love that our relationship deserves can become a reality.